On Sunday June 16th I participated in something called a Spartan Race. Specifically this was a Spartan “Sprint” event. It was advertised as 5km run with 15 or more obstacles along the way. It was taking place at a downhill ski resort. I had viewed some videos online so I had a rough idea of what I might be in for. I was excited to be putting on a race number for the first time since skiing in March. Race day brought rain and muddy conditions, but I would rather race in cool weather than a sweltering hot day. I was registered to race in the 10am wave of runners. I was under the impression that this was to be the competitive “elite wave, but that had somehow been switched to 9am. Before the race start there was some unnecessary shouting and bravado courtesy of a very tall man dressed in a spartan costume. I prefer to speak softly but carry a big stick (the big stick hopefully being my racing abilities). I looked around the start corral quietly assessing the competition (you can admit that you do this too!) and decided to line up right at the front – not something that I do very often. 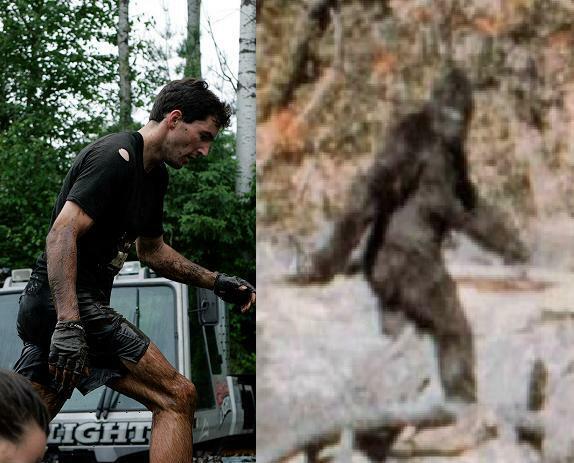 Jan Rossiter or Sasquatch? – the similarities are alarming. The top of the mountain brought a series of obstacles (crawling under barbed wire, jumping over walls, crawling under things other than barbed wire – all in the mud) and I soon began to catch the stragglers from the wave of runners which started 30mins before me. A few spectators gave me a sympathy cheer as they thought I was the last runner from the 9:30 wave. The race then descended at breakneck speed down the hill. A few obstacles later the course turned back up hill. What?! I prepared myself mentally for another climb. My legs were starting to burn but I still powered uphill passing endless lines of people all the way up. The next downhill section featured slippery mud, and wet moss-covered rock. I was able to pick up lots of time by keeping up my momentum through here. The pounding on the knees was however quite intense and not something that I can recommend for anyone who hasn’t done this sort of thing before. Last summer I caused myself some very painful IT band problems after running down from a mountain pass in Switzerland with a full backpack – but that’s a story for another time. Unfortunately the course took one more uphill turn for a third ascent of the mountain. I had to dig deep to get motivated for this climb, and my mode of locomotion could certainly no longer be described as running. The final downhill section ended in a large set of obstacles which taxed the arms (rope climbing, monkey bars, etc.). A final dash across an open fire and past the men trying to take a whack at you with pugil sticks marked the end of the race. My time on Sunday placed me 8th out of about 2,500. The race was also run on Saturday, and if we can compare the times I would have placed 5th that day so overall I’d say I was 12th out of close to 10,000 runners. Not too shabby. I was however disappointing that my heat wasn’t the actual “elite” heat and that I didn’t have more fast runners nearby to push the pace so that we could be closer to the winners time. I’m glad that I tried this race. It was certainly fun, and a glimpse into the culture of such events. I think they are tied to the popularity of the fitness phenomenon known as “crossfit” (a certain shoe brand has begun to sponsor both events). That being said, the race didn’t tax upper body strength too much, and it was the aerobic hill climbing machines (or lungs with legs as my friend calls them) that took the cake on race day. I was pleased with my result – it’s nice to know that I can post a decent result without much specific preparation. I’m certainly not the first skier to dabble in these events. I do have my doubts about these races – the unnecessary bravado and crowds aren’t my cup of tea. The entrance fees are also quite high, yet there are lots of volunteers helping to run them – I suspect that someone is raking in a tidy profit at the end of the day. Despite all that, I think they are a good thing because they are getting many people out for a run, excited about their health and out of their houses and outside with their friends. I just don’t think I’ll be doing another one before the winter – the risk of injury seems a touch higher than some of the other training that I do. P.S. – I wrote this article along time ago, but didn’t get around to editing and posting it. In the meantime two of my training partners from XC Ottawa – Riel and Steffan completed a much longer Spartan “Beast” race and did very well – Riel has written a great article about their experience here. I think he has similar observations about the unnecessary shouting at the start line, and the dangers of downhill running. Great report and a good result!